In 2017 the MSA Trust reached 20 years of supporting people with MSA. In May 1997 Sarah Matheson and a group of close friends met to discuss the possibility of setting up a support group for people who had been diagnosed with MSA, Sarah had received her diagnosis in 1993. The rest, as they say is history and last year the Trust marked their 20th Anniversary. On 13th June 2017 we opened Sarah’s Wood, one of our activities to mark 20 years of support and research by the Trust. Hugh Matheson, our founder Sarah Matheson’s brother, wanted a way to symbolise the hope and support the MSA community can create for each other. To do this he has helped us create Sarah’s Wood. The Wood is located in Thoresby Estate, Nottinghamshire, in the heart of Sherwood Forest and will become a lasting symbol of hope for all people affected by MSA. The opening of the wood reflected this hope. 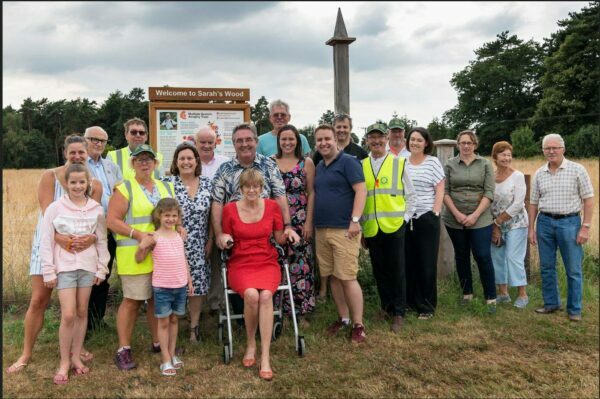 On 21st July 2018, we held a summer event at the invitation of our Trustee, Hugh Matheson, at Sarah’s Wood. At this event we unveiled our brand new sign, which would hopefully help people find Sarah’s Wood and learn more about MSA. It was an afternoon of Tea and cake at Hugh Matheson’s residence and the future of the Wood was also discussed. This year we decided to begin a project to allow our community to properly memorialise loved ones and immortalise their part in this community we have built. As such, we will be building a path that leads directly to Sarah’s tree, this path will be built with individually engraved stones with personalised messages from our community. We hope to symbolise the path we are all on together towards a cure and as more and more join the cause: the longer, the more diverse and the more far reaching our path will become. If you would like more information about becoming part of this community, please visit the form below.